Woot! My new lens arrived! 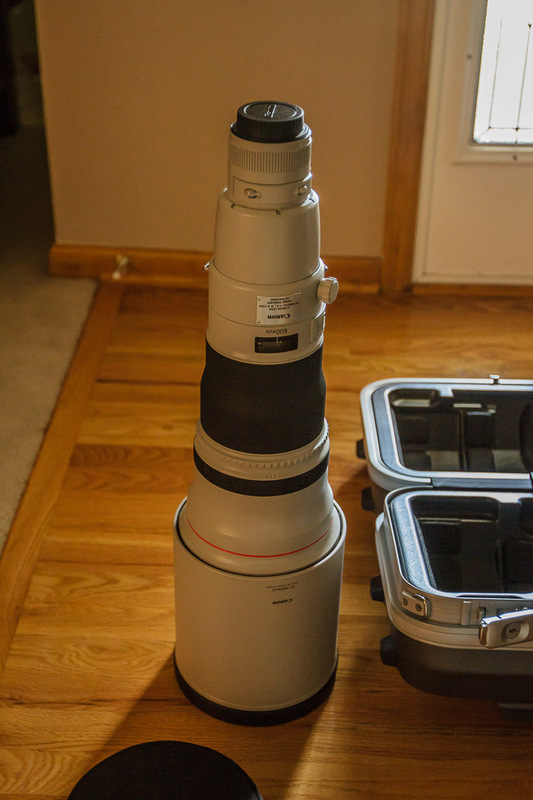 I am, now officially, the proud owner of a brand new EF 600mm f/4 L IS II lens. I wasn’t expecting it until next week, but it arrived today…a day early from the predicted arrival date. I’m a bit surprised, but certainly not complaining. I am not exactly sure how international purchases work, but it didn’t quite work how I expected. I expected a 2.3% import duty on top of the shipping fee. Instead, I was not charged an import duty, but my credit card charged me a 3% “Foreign Transaction Fee” that originally showed up while the transaction was posting as a 1.5% fee. In the end, I ended up getting slammed with $330 in foreign exchange surcharges, but no import taxes. Go figure. I was quite happy to see the warranty card sitting right on top of a very protective hard case specially designed for the lens. I originally almost purchased this lens from a different Canadian store, and when I talked to them on the phone, they said they usually open boxes and take out the warranty cards. I couldn’t get a strait answer regarding why, but I was eventually assured many times that such a thing wouldn’t happen to my order. I canceled that order and ended up buying from Vistek, as their price was better by $150 CAD, their shipping was better by over $200, and their shipping was much faster. Plus, they actually had it in stock. I forgot to ask about the warranty card, though, so I was a bit worried that it would be removed after my discussion with the other store. The hard case is quite nice, and I believe it is sized appropriately for airline carry on standards. It not only closes tightly, it also locks. Thing of beauty. Here the whole thing is, each individual part. 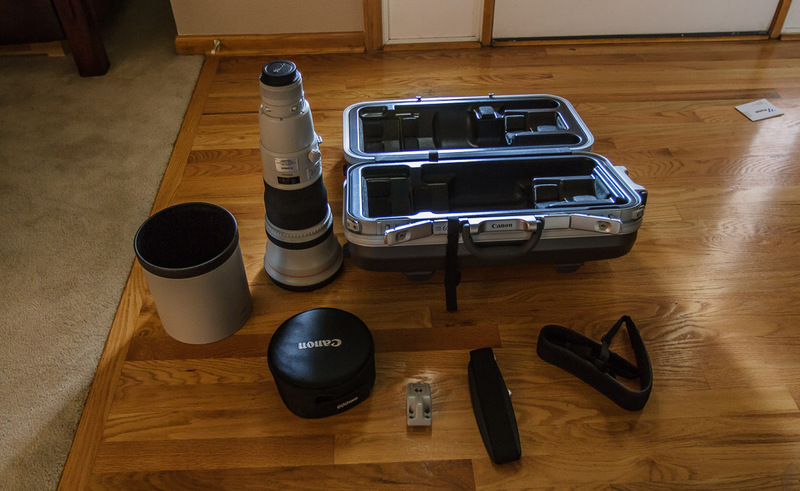 The lens, its hood, the protective lens cap that clips to the hood when in reverse position, and alternative lens foot, carrying strap for the case, and strap for the lens itself. Another nice thing about these lenses is that they are designed to be set upright. 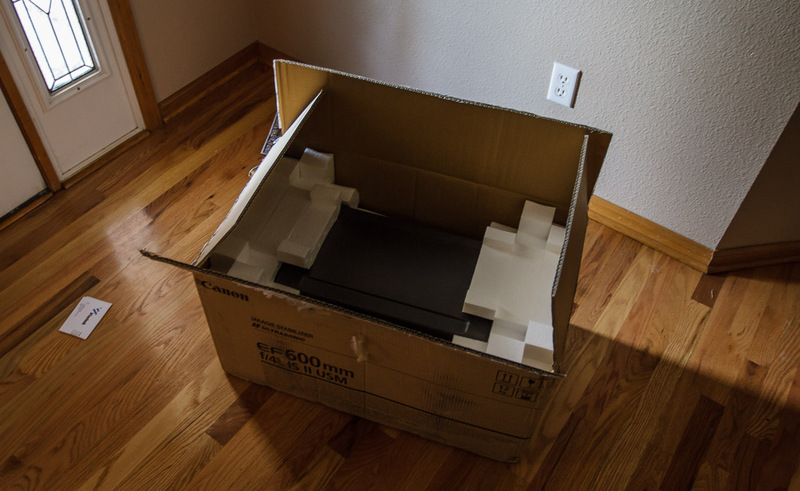 For easy storing when you need quick access, I guess. The lens hood has a rubber edge, which makes for a nice soft impact when setting the lens upright like this on a hard floor. It is a very long lens when the hood is added like that. Surprisingly, though, like all the other Mark II lenses, it has excellent balance, and is extremely usable even with that huge lens hood attached. For size comparison, I’ve photographed it against three 13×19″ A3+ prints I made recently of some of my photography. 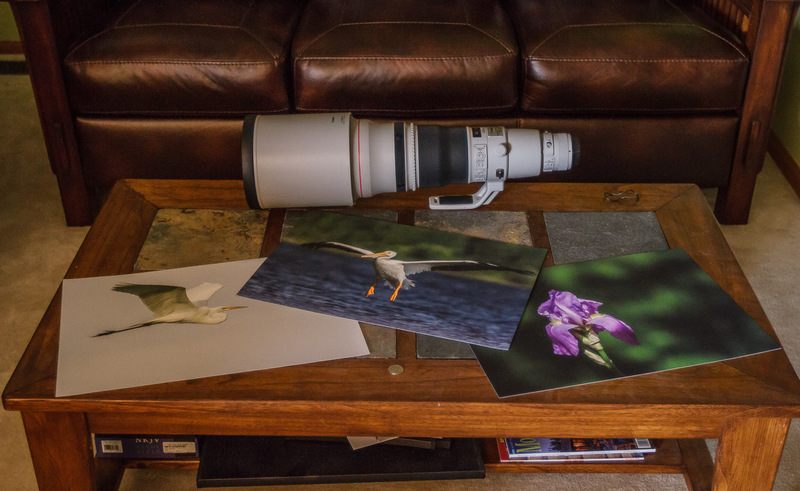 The long edge of each print is 19″ long…so you can see that this lens is about two feet long! In person, it really looks more like a telescope than a lens, and indeed it can probably serve quite well as a very fast telescope (this lens is f/4, while most telescopes are f/10, with some being f/8 or f/6).